“You’re at the centre of one of the most exciting places in the entire wine world, more so than you realise,” was the opening comment of Charles Banks to an audience consisting of local trade and media yesterday. Banks owns the Terroir Life portfolio of wine brands which includes Fable Mountain Vineyards, Marvelous and Mulderbosch locally. Among various Californian projects, he is a backer of Pax Mahle, who makes wines under the Wind Gap and Agharta labels and was the international speaker at the recent Swartland Revolution. In one of the most memorable tastings of the year, Banks showed 15 wines from the Terroir Life portfolio: Soif 2014 and Sonoma Coast Syrah 2013 from Wind Gap; the Grenache 2011 and Sonnie’s Syrah 2011 from the Sawyer Lindquist Vineyard of Qupé; The Gimblett Gimblett Gravels 2013 and Homage Syrah 2010 from Trinity Hill; Agharta 2009; Sandhi Bentrock Chardonnay 2013; Mayacamas Chardonnay 2013; Sandhi La Cote Pinot Noir 2013; the Roussanne 2011 from Qupé and finally the 2010, 2001, 1985 and 1974 vintages of Mayacamas Cabernet Sauvignon. 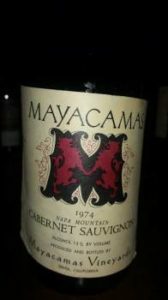 Mayacamas Vineyards, located in the mountains that divide the Napa and Sonoma valleys, is supremely old-school and a wine geek favourite, the 1971 Cab having featured in Steven Spurrier’s Judgement of Paris. The 1974 is the stuff of legend and was a joy to taste: Red fruit, herbs, a touch of mint and some forest floor. Medium to light bodied yet super detailed, the finish long and savoury (#WinemagRating: 95/100). Again, however, I’m quite convinced that South African Cab of the same era would not be overshadowed. What is remarkable, however, about Mayacamas is the steadfastness of vision, with the property having been owned by Bob Travers from 1968 to 2013 when Banks acquired it. The abv of the 1974 was 13%, of the 1985 12.8%, of the 2001 13% and of the 2010 13.25%. The impression, too, that Banks gives is that his commitment to wines of grace and profundity is total and we are therefore lucky to have him at work in our industry.